The day after Mt Gozaisho I went to a traditional party called chankokai (ちゃんこ会) in a Sumo gymnasium of Nagoya. In this party you get served a dish called Chanko by Sumo wrestlers. There are several kinds and flavors of chanko and the most popular, nabe (鍋=pot), is served by the wrestlers directly from the pot to your dish. 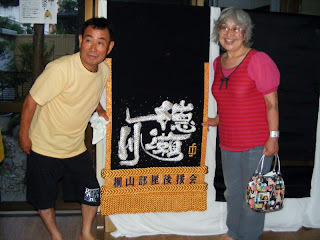 I was invited by Kikuko-san, a very kind woman that volunteers to help international visitors know better about Nagoya and Japanese culture. I met her when I arrived to Nagoya, and she helped me and some other international students with several administration procedures. She also invited me to participate in a Samurai parade which I enjoyed very much. During the event I was sitting down besides the guy on the left in the picture above. 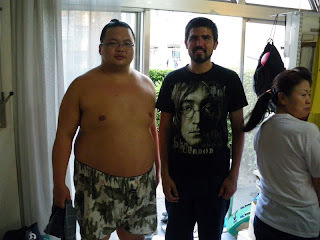 He told me he is manager of several Sumo wrestlers. There is something special about that Sumo belt he is holding but I don't remember exactly (maybe it's the winners belt?). It was quite heavy! And of course I took the obligatory photo with a wrestler. In this case Shimasegawa (嶋瀬川) born in April 4th 1980, height 177cm and weight 147kg. Actually my favorite wrestler was Tokusegawa (徳瀬川) but he was very busy with other people trying to take pictures with him because he was the last champion of some secondary Sumo league. By the way Tokusegawa is Mongolian not Japanese, and he was born in August 6th 1983 and 191cm 154kg. In the video bellow, he is the first one from the left. The party ended with the Sumo wrestlers singing and clapping. Although all of them were in pants, the most funny one was one that was wearing Calvin Klein underwear hehe. I took a first shot in my video. His name is Kongoufuji (金剛富士), March 10th 1983, 183cm and 90kg.